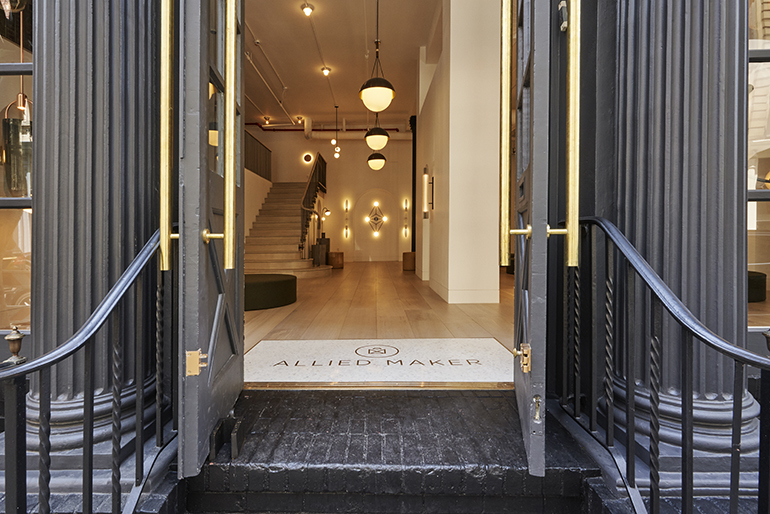 Lighting manufacturer Allied Maker recently opened a showroom in TriBeCa, New York. Photography by Joseph Shubin. 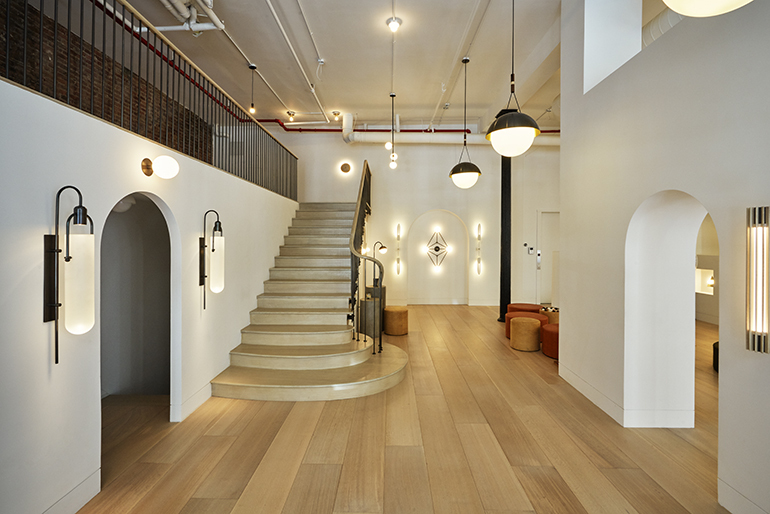 TriBeCa’s renowned design district has welcomed its newest resident. 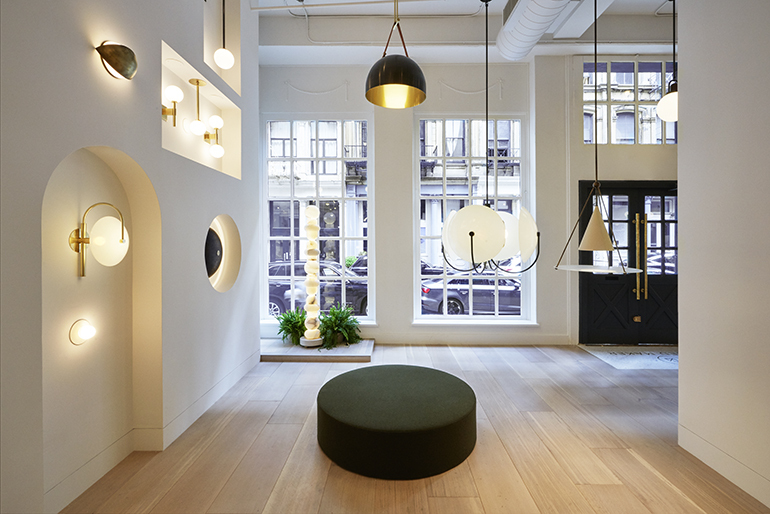 Long Island–based lighting manufacturer Allied Maker has inaugurated a storefront on Franklin Street, bringing a curated selection of artisan-crafted fixtures to the design-friendly locale. 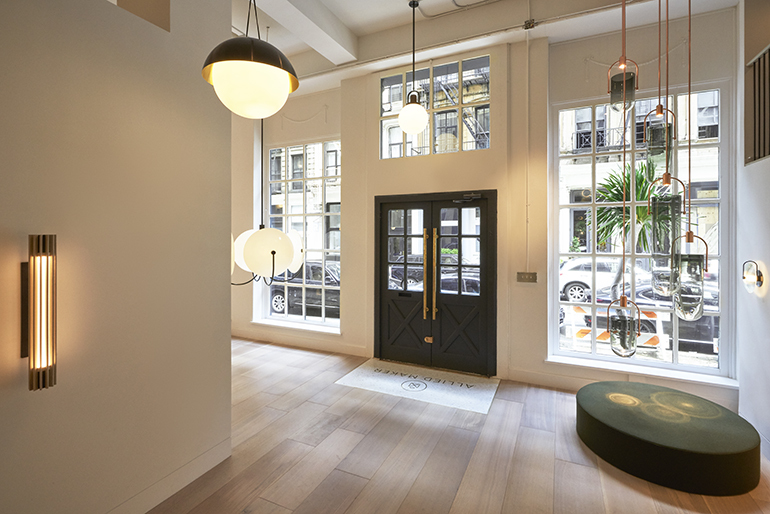 The showroom, which now boasts Le Corbusier–inspired archways and pristine white walls after a lengthy restoration process, feels right at home among other neighborhood mainstays such as R & Company, Patrick Parrish Gallery, and David Weeks Studio. The space, located on Franklin Street, was previously a dentist’s office. Photography by Joseph Shubin. 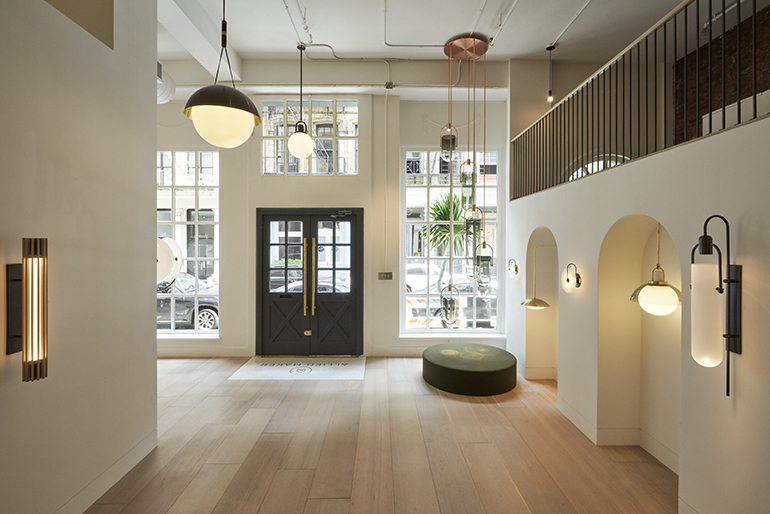 Archways were inspired by Le Corbusier. Photography by Joseph Shubin. To accomplish this, they oversaw every last design detail and selected materials that reflect the brand’s values. For example, flooring is desaturated quarter sawn white oak planks—the same cut used for their fixtures. 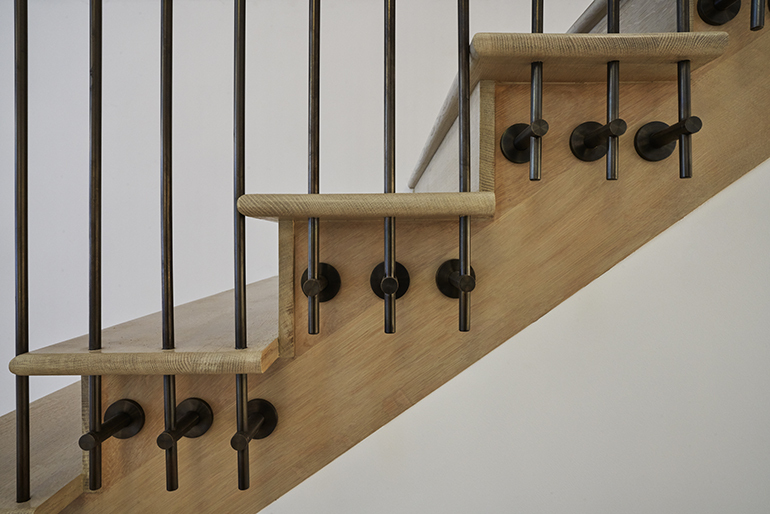 And when the market failed to deliver suitable baluster hardware for the staircase, the duo took it upon themselves to hand-fabricate custom pieces in-house. (They enjoyed the process so much that hardware will soon be a permanent offering). 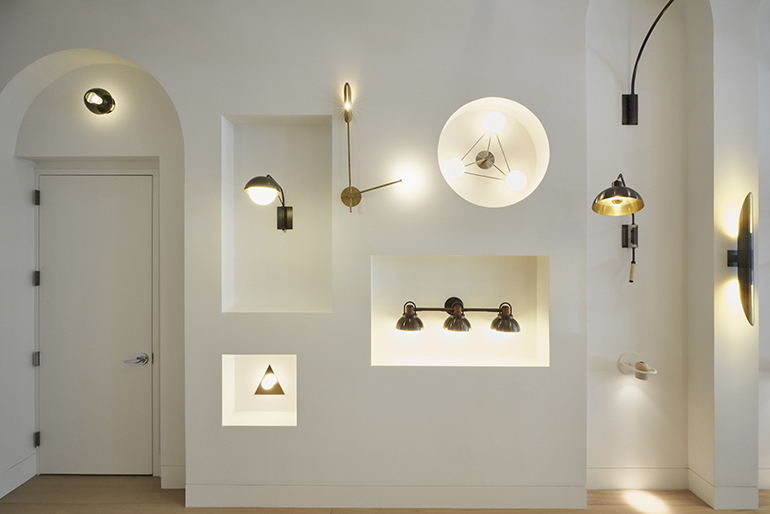 The brand’s fixtures are set against pristine white walls. Photography by Joseph Shubin. 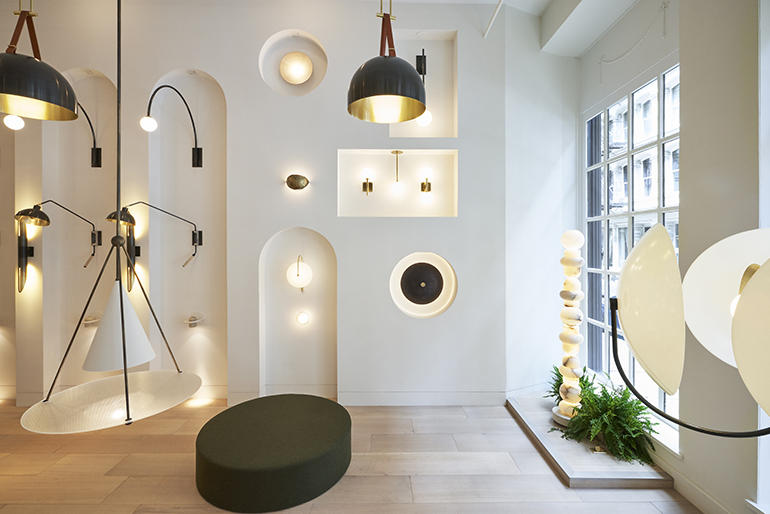 A Totem floor lamp faces the window. Photography by Joseph Shubin. A machinist created the bronze “Allied Maker” logo that Concrete Collaborative installed in terrazzo at the entry. Photography by Joseph Shubin. Door hardware was hand-fabricated in-house. Photography by Joseph Shubin. As was the staircase’s baluster hardware. Photography by Joseph Shubin.